workhouse was erected in Hornes’s Field, now Broad Street. Bewdley's workhouse had its origins in November 1736 when the Mayor and Burgesses of the town decided to erect a workhouse for the maintaining the poor. They donated £206 6s towards the cost of the building which was erected on a rented site, at what is now 64 High Street. When the workhouse opened in 1737, a Governor and Matron were appointed at a salary of 15s.4d. per month. By the 1770s, it held up to 80 paupers. 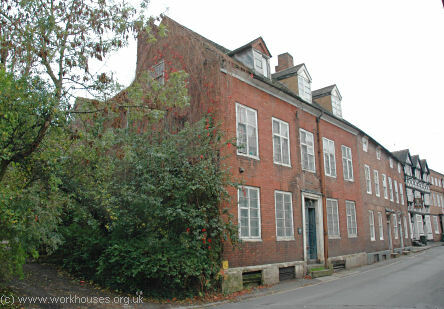 Bewdley former parish workhouse, 2006. A pair of Flatt Irons 4 - 6d. Mr. Edwd Evans for his former Engagement and disappointment. £10 - 0 - 0d. A water cask and 2 hoops 4 - 8d. For 12 Spinning Wheels £4 - 11 - 6d. Thomas Hammonds for 23 days work white-washing and painting £1 - 14 -6d. The Months Milk 6 - 0d. 17 Trenchers, A Ladle, 2 pigons [small vessels], a rolling pin and wooden ware 5 - 8d. Lost by 4 bad half Crowns Recd from the Overseers last year 10 - 0d. On Tun of Coles 10 - 6d. House and Window Tax 17 - 4d. From Philip Pound in part of 16 guineas for a bastd child sworn on him by Sarah Pardoe £10 - 10 - 0d. 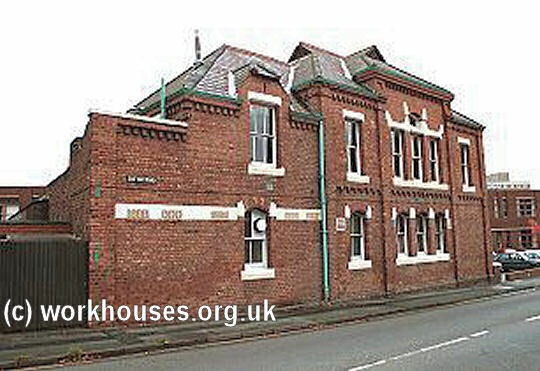 Chaddesley Corbett had a workhouse dating from 1795 situated at the east side of its main street. The building, now known as Harkaway House, was substantially rebuilt in the 1960s. 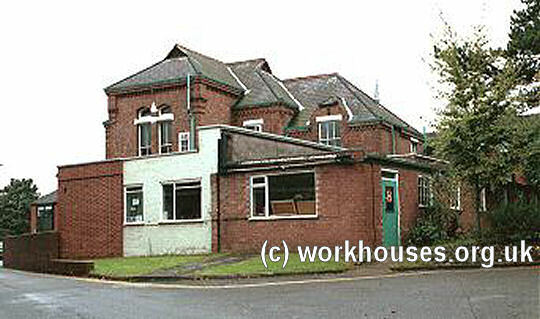 Chaddesley Corbett former parish workhouse, 2006. Pigot's Directory of 1828-9 records that Stourport's workhouse was at Lower Mitton, with Joseph Partridge as its governor. County of Worcester: Bewdley (2), Chaddesley Corbett, Churchill, Kidderminster Borough (5), Kidderminster Foreign (2), Lower Mitton (2), Ribbesford, Rushock, Stone, Wolverley (2). County of Stafford: Broome [Broom], Upper Arley. Later Additions: Stourport (from 1928), Wribbenhall (from 1901). The population falling within the Union at the 1831 census had been 29,908 with parishes ranging in size from Dowles (population 62) to Kidderminster Borough (14,981). The average annual poor-rate expenditure for the period 1833-35 had been £11,733 or 7s.10d. per head. 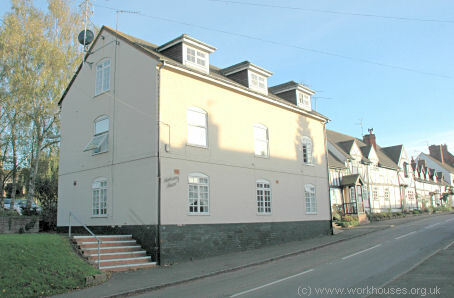 A new union workhouse was erected in 1836-8 at the east side of Sutton Road in Kidderminster. It was designed by William Knight and J Nettleship. The Poor Law Commissioners authorised an expenditure of £5,650 on construction of the building which was to accommodate 400. It broadly followed the model cruciform plan published by the Commissioners in 1835. Additions in 1884 included a 66-bed men's hospital, a 50-bed women's hospital, a school, a bakery, a brewery, and a boiler-house. In 1889, an adjacent inn called the Tap House was purchased by the Guardians, who demolished it and added the ground to the workhouse site. The workhouse location and layout are shown of the 1902 map below. The only surviving buildings are now (2007) an entrance lodge and vagrants' block at the west of the site, erected in 1874 to a design by local architect JT Meredith. The ground floor contained a waiting area, interview room, porter's day room with adjacent bedroom, bread room and overseers' room. Stairs led to the Guardians' board room on the first floor with a clerk's room and retiring room for the use of the Guardians. They had a separate entrance and stairs leading directly to the board room. At the rear were vagrant wards, now demolished apart from a bathroom linked to the main block. The male vagrants' accommodation included nine sleeping cells measuring 10 feet by four feet, and nine labour cells facing them across a passageway. There was also a double room and three single rooms for women. The labour cells were used for stone-breaking. Rocks were broken up until the pieces were small enough to pass through a grille to the stone-yard outside. Kidderminster entrance lodge from the north-west, 2000. Kidderminster entrance lodge from the north-east, 2000. On Monday, John Stokes, the porter of the Kidderminster Union workhouse, was brought before the county magistrates on the charge of ill-treating a pauper boy in the house, named Perks, aged 8 years. From the evidence it appeared, that the child had a disease of the bladder, which gave great offence to the defendant, who had often punished the boy for the involuntary effects of the complaint. On the previous morning, groans were heard issuing from a sack hanging up from a beam, and on the Governor of the Workhouse cutting it down, the child was found doubled up within the bag, in which state the porter had kept him suspended all the morning ; this ferocious act had been previously perpetrated on several other occasions. The former workhouse site later became Kidderminster General Hospital. From around 1915, the union leased a property known as Sunnyside in Franche Road for use as a children's home. It could house 40 children. The property is now in private residential use. Worcestershire Archive and Archaeology Service, The Hive, Sawmill Walk, The Butts, Worcester, WR1 3PB. Holdings include: Guardians' minute books (1836-1928); Admissions and discharges (1904-31); Deaths register (1866-84, 1895-1919); etc.